Featured Resource: Spring is the time to look into summer camps! While CSFP does not fund summer camp or extra-curricular activities for your children, we know that out of school time is important. Check out our listing of free and low-cost summer learning opportunities today! CSFP provides partial, need-based scholarships to be used in grades K-8. All families who are selected from CSFP’s random scholarship lottery must contribute tuition to their child’s school. 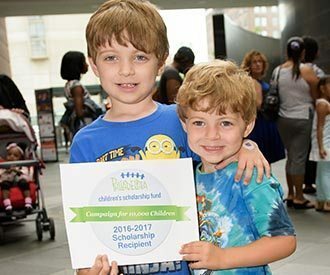 As the tuition rates at CSFP’s more than 170 partner schools vary greatly, we understand that sometimes families need additional support. If you are researching for additional scholarships for your children, use the links below as a starting point. Let us help simplify the process of finding a great school for your child! Find schools by type, focus, and more. You can estimate the amount of a partial, needs-based, CSFP scholarship your family may receive. Join us each fall for a free, open-to-the-public, Philly K-8 School Fair. Join CSFP for special events just for our families. All CSFP families with children in grades 3-5 are invited to participate in our new book club! Free academic support for CSFP 8th graders and alumni. Find free and low-cost out-of-school-time activities for your child. Find opportunities for your child to continue their education in the summertime! While CSFP is the largest and most diverse provider of K-8th grade scholarships in PA, other opportunities do exist. CSFP funds children through 8th grade, but there are many oppotunities to secure funding for high school! Advice on keeping children in school and families invested in their children's education. Are you a CSFP partner school or interested in becoming one? Find resources on maintaining and increasing quality Pre-K at your school. A quality Pre-K experience can dramatically impact your child's future. Learn what to look for and how to afford great Pre-K programs. Find ways to get involved in the movement for quality Pre-K in Pennsylvania. Find support and activities to help your former CSFP child succeed in high school. Learn about colleges and the admissions process, and get help getting into college. Have you received CSFP's support in the past? We would love to get to know you!